KISS are releasing “Destroyer: Resurrected” on August 21. 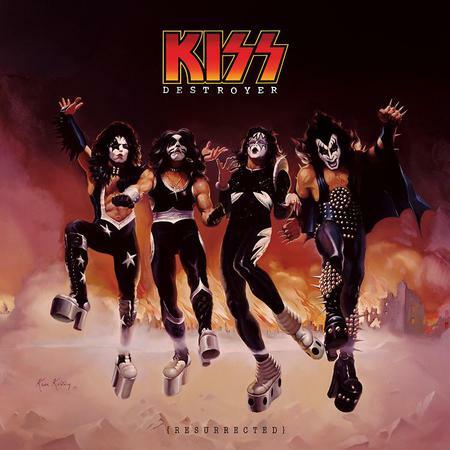 Hot on the heels of their breakthrough hit album “Alive!,” KISS released their fourth studio album “Destroyer,” considered the most ambitious studio recording of KISS's '70s catalog. Originally released as the B-side to the single “Detroit Rock City,” “Beth” – the heart-yearning ballad co-written and performed by drummer Peter Criss – was quickly picked up by radio nationwide and became the first top 10 for KISS, climbing all the way to #7 on the Billboard Hot 100 chart. While going through the original tapes, a forgotten vocal piece that was originally edited out in the final mix of “Beth” was discovered and now, for the first time, the complete original vocal recording has been restored and is included in the final mix. Other rediscovered gems include a complete, alternate guitar solo for the track “Sweet Pain,” now heard for the first time since it was originally recorded. The newly remixed “Sweet Pain” with the original guitar solo will be included as a bonus track. In addition to the treasures found buried in the hours of recordings, KISS classics such as “Detroit Rock City,” “Shout It Out Loud,” “Do You Love Me?” and “God of Thunder” were painstakingly remixed by Ezrin as he fleshed out the drums and guitars, bringing out the bottom end to the bass, making his mixes tight and tough. “Destroyer: Resurrected” will now be issued with the originally intended cover art thought too controversial for the time. Created by artist Ken Kelly, the “brown” cover depicts KISS dressed in their ALIVE! costumes and standing on rubble in front of a burning city in ruins. At the time, the record company thought it was too violent and settled for the tamer “blue” version known today. This release also marked the first time that a comic-book illustration of the band appeared on the cover, confirming that the band was transforming from hard rockers to superheroes. KISS launch a summer North American tour with Motley Crue this Friday in Bristow, VA.